After yesterday’s 20 yo from the Nectar here is a 24 yo Littlemill from another respected European bottler, the Whisky Agency–this one released once the Littlemill renaissance was well underway. Will this bust my streak of soap in Littlemill and finally take me into the 90s for this distillery? Let’s jump right into it and see. There’s been a bit of a Littlemill renaissance in the last few years. 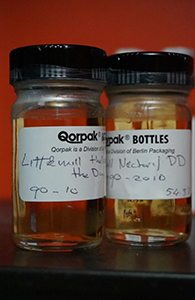 As so often seems to happen with closed distilleries that had ho-hum reputations when they were open, casks of Littlemill that have now sat around for two decades or more since the distillery closed have matured to display very positive characteristics: in particular, an intensely fruity character. Casks from 1988-1990, just before the distillery closed, are the ones that seem to be receiving the most plaudits. This one, bottled by the Nectar, is from 1990 but was released a few years ago, a little before the Littlemill renaissance really got underway. Let’s get right to it. This is the last of the four Scott’s Selection bottles I purchased and split with four friends. None of the others have disappointed, though only the Highland Park has made me wish I’d bought an entire bottle. What will this Littlemill’s story be? 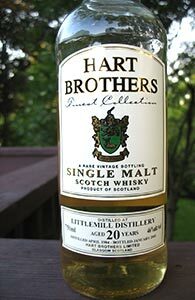 The only other 1984 I’ve had from this distillery (and the only other Littlemill I’ve reviewed) was a rather odd one from Hart Bros. (and that was a 20 yo too). Let’s hope for the best. 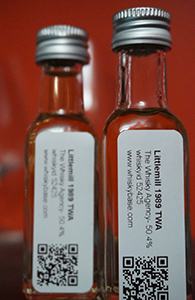 Littlemill, a closed distillery from the Lowlands region, is yet more proof of the fact that the best thing a distillery can do for its reputation is to shut down. Never beloved by the masses when it was open, the bottles available in the first decade and a half after it closed (in 1994) did little to change anyone’s mind. 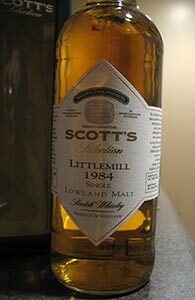 But every worm turns and in the last couple of years a number of highly regarded Littlemills from the late 1980s and early 1990s have been released by a number of indie bottlers. I have a few of those in the stash, but this is not one of them. This bottle is from 1984–considered by some to be part of a problematic era at Littlemill. However, the sudden recent uptick in the reputation of the recent releases made me wonder if older ones from earlier in the 1980s might in fact be better than the distillery’s reputation might suggest (whisky geeks, alas, are very prone to herd mentality in confirming the virtues or faults of entire distilleries or eras at distilleries that are supposed to be exceptional one way or the other). And the very low price asked for it by Binny’s as part of their ongoing closeout sale emboldened me. Good idea? Bad idea? Let’s see.